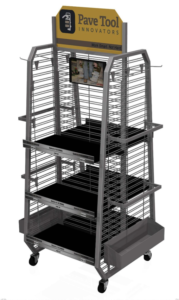 Our objective for today’s blog is to share 10 POP display ideas for industrial and home improvement products. Unlike many of the consumer products displays we design, industrial and home improvement products often require more floor space and are harder to display. Our hope is that these 10 concepts would inspire creative design work in this vertical market. 1. Zodiac Pool Cleaner Solution Center– We designed this 2-tier Zodiac pool cleaner solutions center to go into Leslie’s Pool Supply stores. 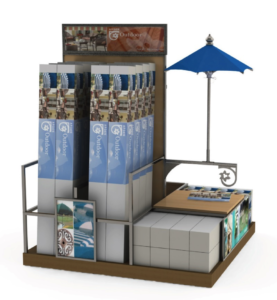 The knock-down island display was constructed of MDF with castors, raised platforms with aluminum stand-offs and shelf and header graphics. 2. Arden Umbrella Display– Arden asked RICH LTD. to design an umbrella platform display to merchandise its umbrellas in large home improvement stores. We created an MDF platform with a metal tube frame, MDF back panel, and framed header, front, and side graphics. Importantly, we created a side bar with a matching logo element to which we mounted a smaller version of the umbrella product. 3. BakerStone Pegboard Display– BakerStone was looking for a cost-effective way to merchandise its Pizza Oven box kit and accessories. 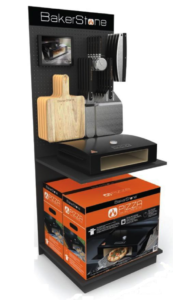 We designed this freestanding floor display which featured a sheet metal base, a glorifier shelf to showcase its pizza oven, a pegboard back panel for hanging accessories and a framed graphic, a bottom shelf for boxed product and a logo header graphic. 4. HardieWrap Floor Display- James Hardie was looking to create a floor display for its HardieWrap product to go into Lowes home improvement stores. We designed this display with MDF back and panels, shelf standards, a sheet metal shelf, sheet metal product organizers, a sheet metal base, and a 3-sided header with digitally printed vinyl graphics. 5. Fein Floor Display- RICH LTD. designed this 2-sided pegboard floor display to merchandise Fein’s tools in home improvement stores. We created an industrial feel with a durable sheet metal base and a 2-part and 2-sided pegboard center panel which was attached to a metal tube frame. The display included 4 branded sheet metal shelves, a side brochure holder, a PVC header graphic, and silk screened base graphics. 6. 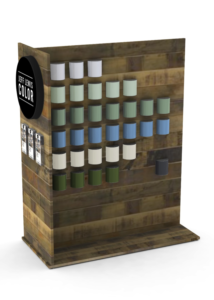 Jeff Lewis Design Display– In 2013 Jeff Lewis Design launched a line of paint with handcrafted colors exclusively available at Home Depot. We designed this floor display which needed to have a designer feel yet work within a home improvement store. 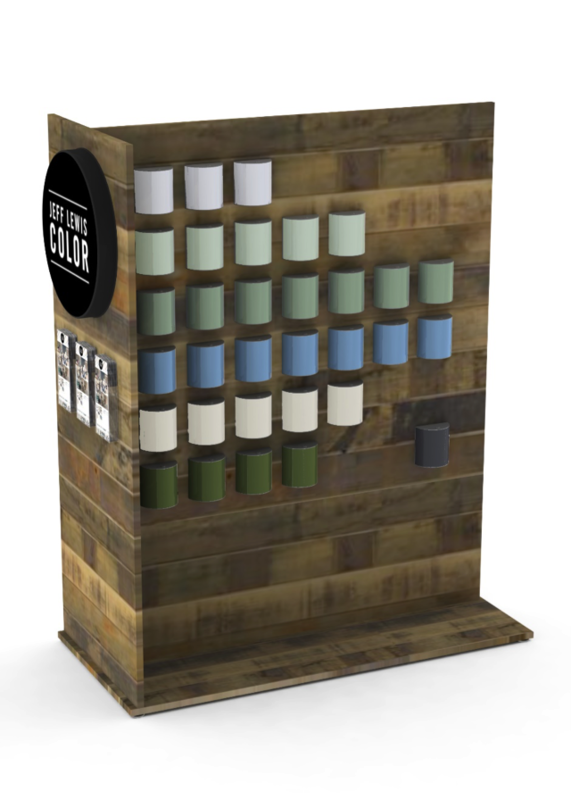 We created a 3-sided floor merchandiser constructed of reclaimed wood which displayed paint color samples on two sides and included a glossy black logo with white screen printing and brochures on the third side. 7. Pave Tool Innovators Floor Display– Pave Tool Innovators needed a cost-effective mobile floor display to display its paver and wall tools. 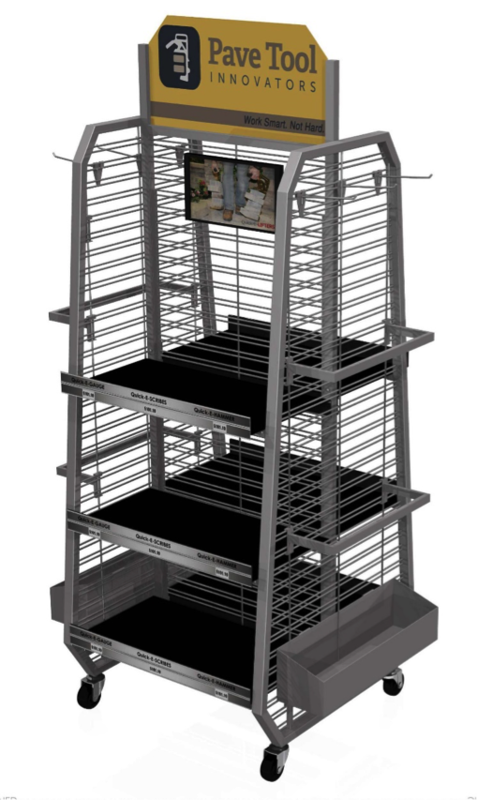 We created this knock-down metal display using square tubing with wire grids and sheet metal shelves. The display included numerous display accessories such as sheet metal baskets, single peg hooks, and hanging bars. We also included a framed lifestyle graphic and die-cut PVC header sign. 8. ADI Floor Display- ADI is a wholesale distributor and marketer of decking-related specialty products. The company sells primarily to lumber yards, home improvement centers, and building centers. 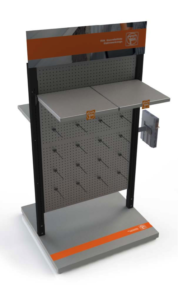 ADI needed a simple and inexpensive 1-sided floor display to provide basic information about its products and merchandise a few accessory items. 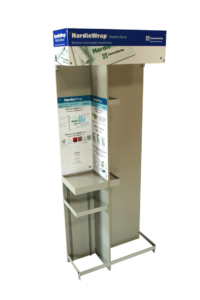 We designed a simple metal tube structure with a shelf for ADI’s catalog, a perforated sheet metal strip for hanging product, and a large PVC graphic header. 9. 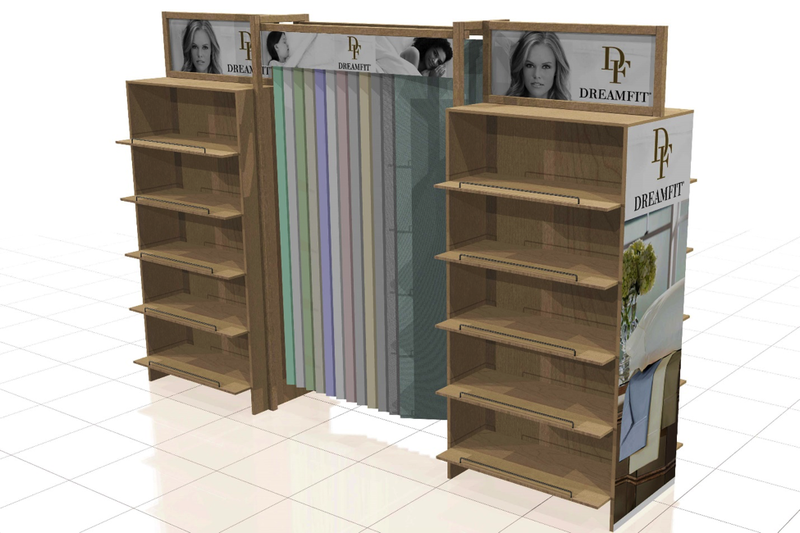 DreamFit Floor Display– We designed this large 2-sided floor display for DreamFit sheets and bedding products. The centerpiece of the display included a section of hanging sheets that was designed to enable a shopper to touch and feel the product. We flanked the centerpiece by two 2-sided MDF cabinets with 5 adjustable shelves per side per unit for a total of 20 shelves. 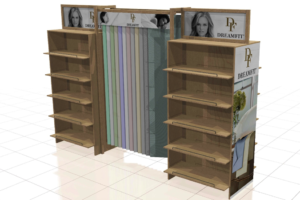 This high capacity floor display featured ample header and side graphics to reinforce the DreamFit brand. 10. 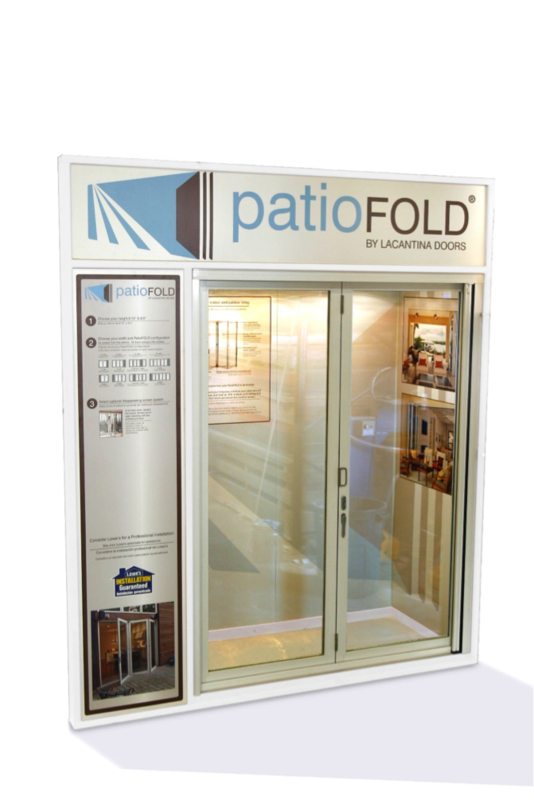 La Cantina Doors Floor Display– RICH LTD. designed this full-size display for the home improvement store environment. 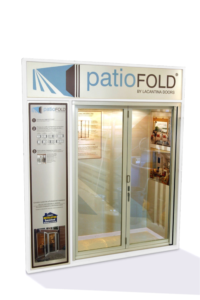 The display used La Cantina’s PatioFold doors and enabled the shopper to engage in the experience of stepping inside the display and then walking outside through the doors. We used digitally printed graphics and ceiling lighting on the inside of the display to portray the inside of a home and included full-length informational graphics on the outside along with a large brand-building header sign. The wine & spirits industry is, by nature, very promotionally driven. Impulse governs much of the behavior of consumers in the adult beverage space so creating a POP display that triggers an on-the-spot purchase decision is important. At the same time, creating cost-effective displays is essential since most displays are only in stores for a limited period of time so keeping the display cost relatively low is important to generating a positive return on investment. 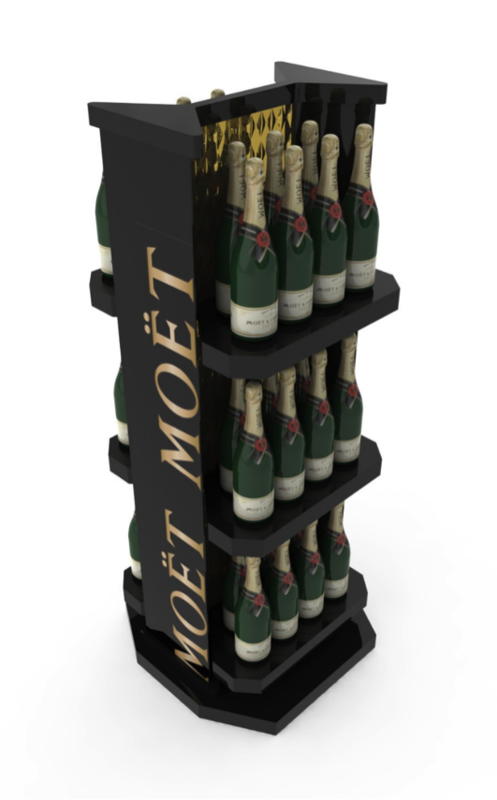 In today’s blog, we’ll review 10 POP display concepts we designed which we hope will serve as creative inspiration for your next POP display project. 1. 4 Orange Premium Vodka– This innovative spirit is exclusively distilled from four distinct varieties of Florida oranges at Florida’s first registered distillery. Our objective was to design a unique, affordable, and natural floor display to merchandise a case of 750ml bottles. Our design was constructed from solid pine wood with a golden oak stain. 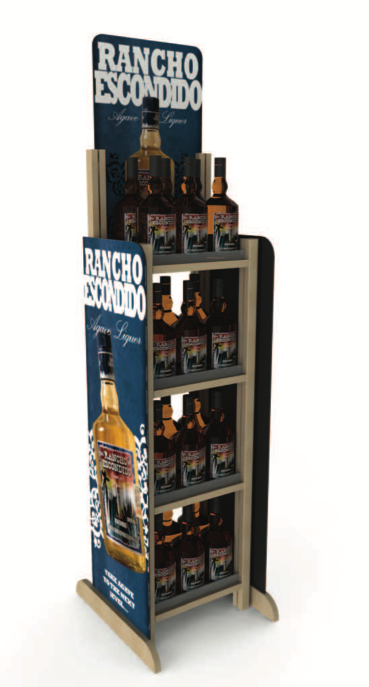 The 1-sided, 1-shelf display shown below was intended to create a crate-like feel with strong branding on the front, header and sides. 2. Argento Premium Argentine Wine– We designed the modular floor display shown below for Bodega Argento, a premium wine from the famous Mendoza winegrowing region which produces more than 80% of Argentina’s premium wines. The main design objective of this display was to create a modular unit using shipping crates that could be used to ship the wine and also serve as the core components of the display. 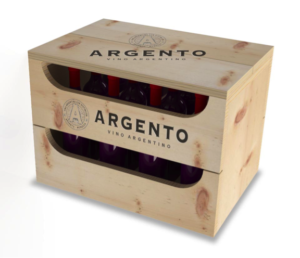 Each crate was designed to hold a case of Argento. The second image below shows the basic shipping crate with the top. The crates were designed to be constructed of solid pine with 1-color screen printed graphics. 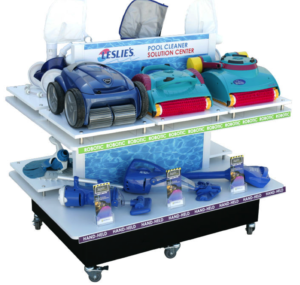 The floor display was designed to include three modular crates plus a removable header. 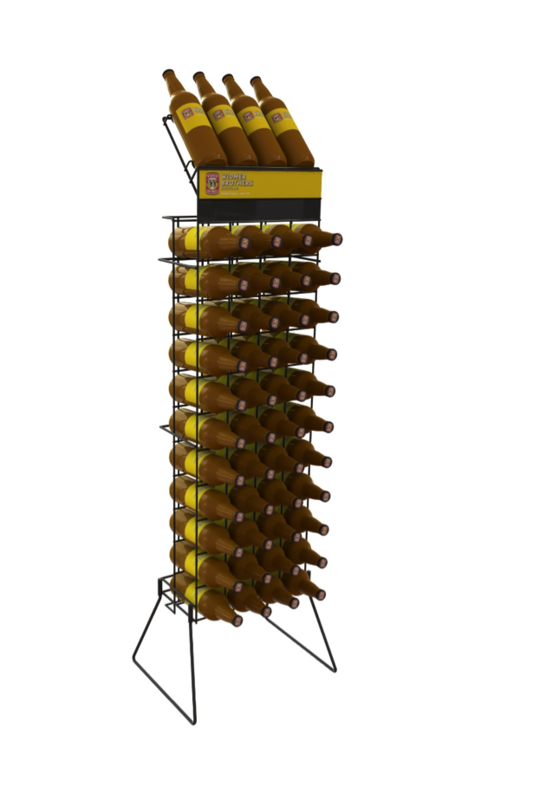 We also created a modular product glorifier that could be used on one or more modules to enable customers to see a front-facing view of the bottle. 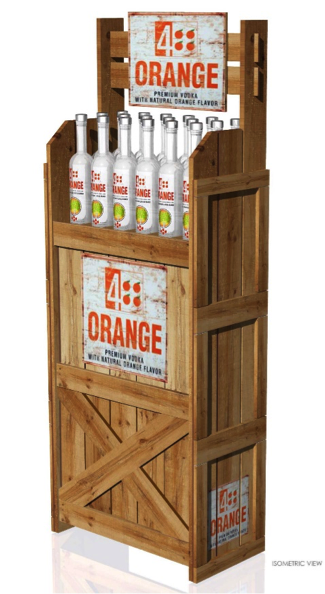 A single crate with the header could also serve as a counter display. 3. 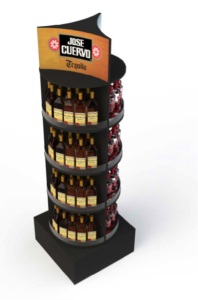 Diageo Jose Cuervo and Smirnoff– We designed a 3-sided floor display to merchandise 3 different Diageo brands. 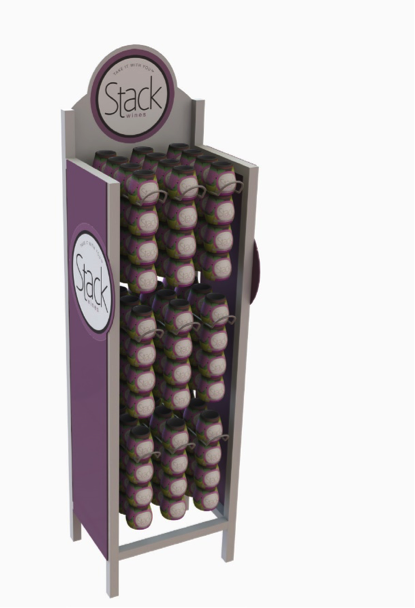 Each side of the display was designed to hold 2 cases of individual bottles. The Jose Cuervo and Smirnoff sides are shown below. We designed the display with a black MDF base and sheet metal structure with 4 levels of rounded shelves and a 3-sided header with interchangeable graphics. 4. Moet Hennessy Champagne– We created the simple 2-sided display shown below to hold 4 cases of Moet Hennessy’s champagne. 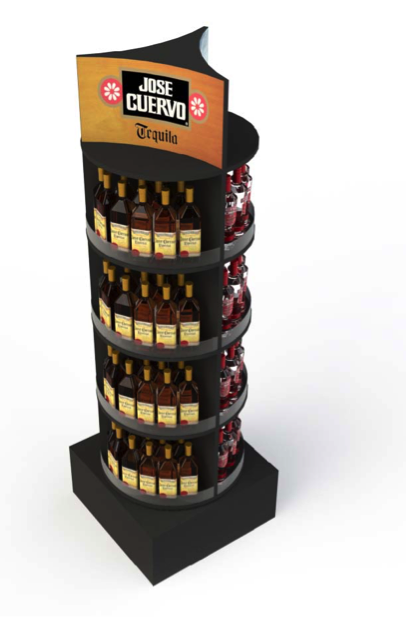 This 6-shelf display was constructed of black MDF with side graphics and a gold foil back panel accent. 5. Rancho Escondido Agave Spirit– Martinez Brands’ Rancho Escondido Agave Spirit is the number one selling spirit in Mexico. This award-winning spirit sells more cases in Mexico than the top three tequila brands. 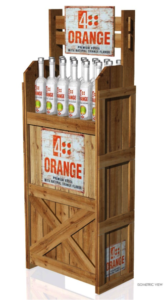 We designed a very simple, knock-down, 1-sided, 4-shelf floor display made of solid wood to hold 2 cases of 750ml bottles. We added die-cut digitally printed PVC side and header signs to reinforce the spirit’s strong brand image. 6. Samuel Adams Infinium- Sam Adams created a unique champagne-like specialty craft beer with fine bubbles and a fruity, spicy aroma. 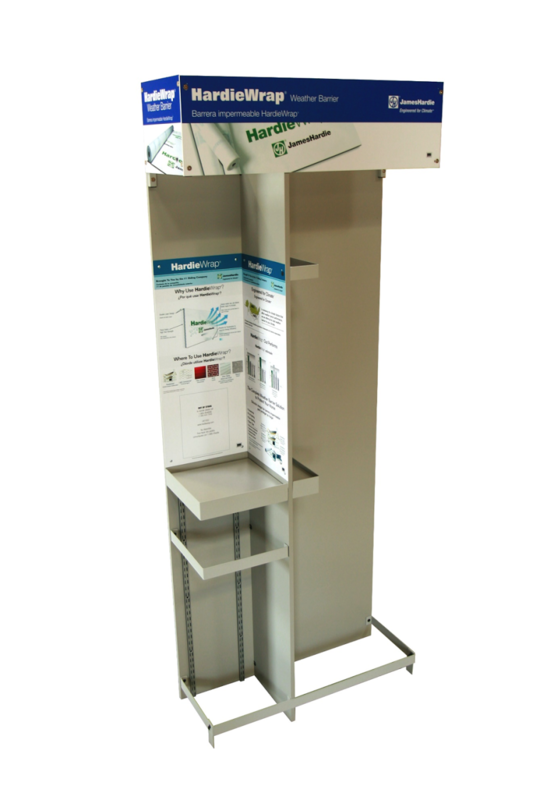 We designed a 5-shelf knock-down display with a metal tube frame and angled shelves. We added a 3-bottle glorifier deck and removable side and header digitally printed PVC graphics. 7. 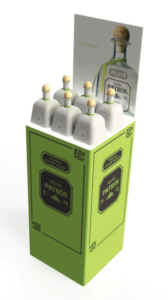 Patron Spirits– Patron is the number one ultra-premium brand of tequila in the world. We designed the podium display shown below to showcase 6 bottles of Patron. We designed this as an MDF box wrapped in vinyl graphics with a glossy white top and a removable PVC header graphic. 8. Stack Wine– Stack Wine makes it easy to take wine with you by offering a pack of 4 individual servings of California wine in a glass container. The company asked RICH LTD. to design a metal floor display that would enable them to hang their 4-packs. 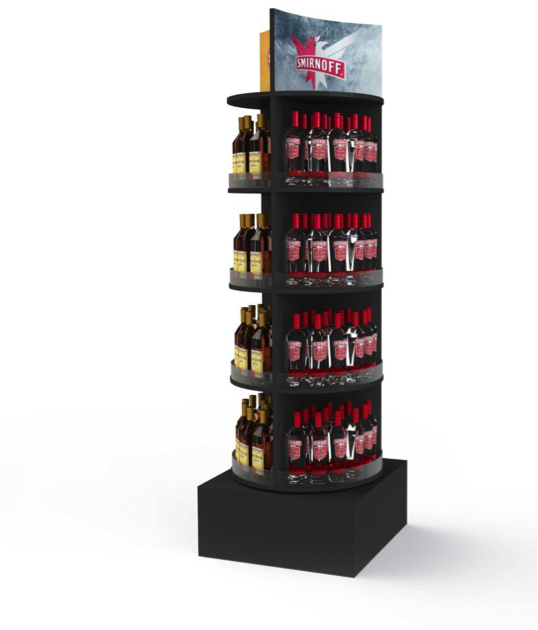 We created a 3-tier metal tube display with 9 hanging loops to hold a total of 36 4-packs. The display featured a die-cut PVC header sign and side signs to promote the brand. 9. 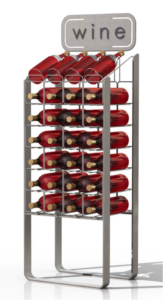 Economy Wine Display– We designed the economy wire wine display to hold 4 cases of wine. The main body of this knock-down wire display holds 44 bottles. We added a 4-bottle angled glorifier and a channel for a removable header sign. This type of display is a good choice for a tight budget. 10. 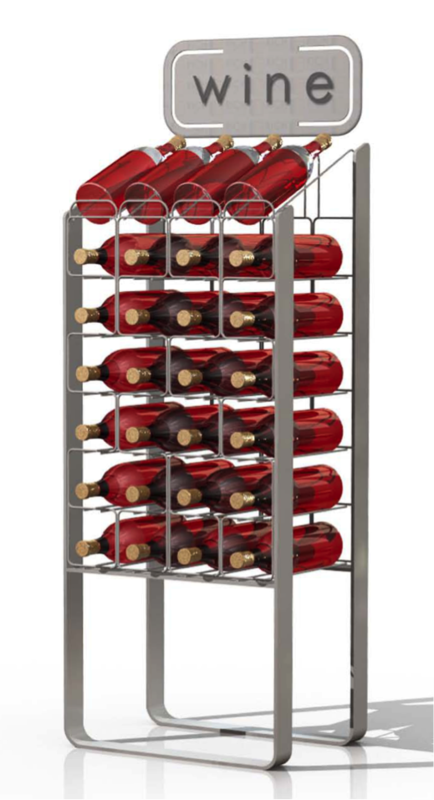 Economy Wine Display– Our last example is another economy wine display that holds 2 cases plus an angled 4-case glorifier. The display was designed with a sheet metal frame and wire wine holders. The header sign could be screen printed sheet metal or digitally printed PVC. Like the previous example, this display was intended to be simple and affordable.